​The Harlan Board Trotters host a family board game event every Tuesday night at the Harlan Hy-vee from 4-9 pm. No experience needed. Games are free to play. Check out Harlan Board Trotters on Facebook for details and updates. ​​The Shelby County Food Pantry needs donations. Donations can be made year round at the West Central Community Action on 7th Street in Harlan. Both non-perishable food items and non-food items can be donated. The American Red Cross has a sever shortage of type O blood and urges type O donors - as well as eligible blood and platelet donors of all blood types to give now to ensure lifesaving patient care isn't impacted. The Harlan Senior Center will be hosting quilting at 9 am. A Legislative Coffee will be held 10 am, Saturday, April 20th. 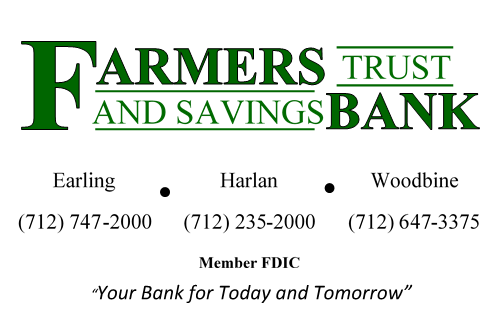 The event is sponsored by and hosted by Shelby County Farm Bureau at 908 6th Street in Harlan. This will be the last legislative coffee for 2019. Saturday, April 20, Kimballton Annual Easter Egg Hunt, Kimballton City Park, 11 am. Anyone wishing to donate to the event can drop off their donations at the City Clerk's Office Monday through Friday 1 - 5 pm. Saturday, April 20th, Dunlap will hold their annual Easter Egg Hunt, starting at 10 am in the Boyer Valley Youth Sports Complex. Kids will be divided into age groups on three separate fields. Remember to bring a basket or container to collect the eggs, candy and prizes. In case of bad weather, the hunt will be held in the Boyer Valley Middle school High school gym. The Little Sioux Easter Egg Hunt will be held Saturday, April 20th, at 1 pm in the City Park. This event is sponsored by the Auxiliary of American Legion Post 410 The Little Sioux Homecoming Association will hold a bake sale in the American Legion Hall beginning at 10 am. The annual Missouri Valley Easter Egg Hunt will be held Saturday, April 20th, beginning at 1 pm at the Wisecup Youth Ballfields complex. There will be 3 age groups, Pre-K, Kindergarten and first grade and 2nd through 4th grades. The Easter Bunny will be on hand for photos as well. The event is sponsored by the Missouri Valley Lions Club. The Logan annual Easter Egg Hunt will be held Saturday, April 20th, beginning at 2 pm in Logan City Park. There will be more than 7,000 pieces of candy for 3 age groups, preschool, ages 5 to 7 and 8 to 10. The annual event is sponsored by the Logan Chamber of Commerce. The Hawkeye Ramblers 4-H Club will host the annual Woodbine Easter Egg Hunt on Saturday, April 20th, beginning at 2 pm, in the Woodbine City Park. Children, infant through 5th grade are welcome to attend. There will be 3 separate candy hunting areas: infant-Preschool, kindergarten to 2nd grades and third through 5th grades. Prizes will be awarded to children who find one of the plastic eggs with a note inside. In the event of poor weather, the event will be held at the school. ​The City of Elk Horn's annual Easter Egg Hunt will be held Saturday, April 20th, at 2 pm, in the Elk Horn City Park. In case of rain, the event will be held at the Salem Home. The Easter Egg Hunt is for Children 12 and under. Photos with the Easter Bunny will be taken from 1:30 to 2 pm. The Spring Dutch Oven class at Nishna Bend Recreation Area will be held on Monday, April 22nd, beginning at 5:30 pm. The class will be a Mexican and Italian theme with desserts. The cost of the class is $10 for adults and $5 for kids 10 and under. Preregistration is required. Call Iowa Western Community College at 755-3568 or Christina at 744-3403 to sign up. The Fun China Luncheon will be held Wednesday, April 24th at the Harlan Golf and Country Club Ballroom. Everyone is invited. There will be two seatings: 11:15 and 12:30. The cost is $15 per person. To reserve your tickets, call the Shelby County Chamber of Commerce and Industry at 755-2114. or e-mail them at info@exploreshelbycounty.com. 10:30 am - Story Time: Springtime; 7 pm - 5 O'clock Somewhere Book Club will meet at Danish Countryside Vines and Wines in Elk Horn. Head to St. Joseph's Parish in Earling for Bingo! Early bird starts at 6:30 pm and regular bing starts at 7 pm. Lunch will be available. The Museum of Danish America in Elk Horn invites you their brown bag luncheon Thursday, April 25th, at 12 noon. The topic this week is Life as a Peace Corps volunteer in Paraguay, presented by Dana Johnson. Celebrate Spring with Myrtue Medical Center Auxiliary's Spring Fling Thursday, April 25th from 5 to 7 pm at St. Michael's Rosman Parish Hall. They'll be serving a delicious Staley's chicken dinner, complete with mashed potatoes and gravy, vegetable, roll, homemade dessert and a beverage all for $10 for adults and $5 for children under 10! Purchase your tickets at the Auxiliary Gift Shop or at the door the day of the event. Harlan Community Swim Team sign-up will be Thursday, April 25th, at Vet's Auditorium in Harlan. Board members and coaches will be available to answer questions and will have ​apparel and swim gear to purchase. Practice starts May 28th with the first meet June 8th. The season ends July 13th. Looking to have some fun this summer and meet some new people? To all interested in playing in the Denison Adult Men’s and Co-ed Slow pitch softball league individuals or teams the deadline to sign up a team or let someone know you want to be on a team will be April 26th and there will be a captains meet meeting on Tuesday May 7th at Bank Iowa . The League will start May 21st and May 23rd. If you are planning on having a team or looking to have a team come on out everyone is welcome. For more questions and information contact any board member Sam Ellis, Brian Kempfert, Nick Riessen, Darren Slechta, JJ Johnson or call the Denison Aquatic Center at 263-8130 or messages us on our Facebook Denison Slow-Pitch Softball Association. Deadline to sign up again will be April 26th. KidsFest will be held on Saturday, April 27th. This tri-annual health fair focuses on health and safety education for children birth to 11 years of age. You will have many opportunities to talk to safety and health experts, have fun and receive incentives that promote the health of children. The Museum of Danish America will host an afternoon of classical piano music performed by 6 students from Omaha, Des Moines and southwest Iowa on Saturday, April 27th, at 2 pm. All six have won first or second prize in their regional piano competitions, and this joint recital provides the opportunity for them to perform on Danish-American pianist and humorist Victor Borge's ***BORE-guhz*** own piano. The recital is free to the public and all are welcome to the post-performance reception. Carson’s City Wide Garage Sale will be held Saturday, April 27th, 8 am to noon, rain or shine. It will be held in conjunction with the City of Macedonia and Henderson’s garage sales! Come and save on just about anything you need, or think you need. A number of people will be set up in the Carson Community Center….or just talk a walk around town to find hundreds of bargains. A list of sales will be available at the Community Center the morning of the sales. The Defiance Legion Post #707 invites you to a breakfast fundraiser for Jerry and Judy Kline of Defiance Sunday, April 28th, from 8 to noon, at the Defiance Fire Station. They’ll be serving a delicious breakfast of biscuits and gravy, pancakes, eggs, sausage, juice and coffee all for a free will donation. Everyone is welcome, so please come and join them. OWLS: Older, Wiser Learning Seniors @ the Harlan Senior Center at 12 pm. Activities at the Harlan Community Library include Story Time: Happy May Day at 10:30 am. The 1st Annual NAMI in the Park will be held Saturday, Mary 4th, from 10 am to 2 pm, at Pioneer Park in Harlan. Join Southwest Iowa NAMI, the National Alliance on Mental Illness for a day of food, fellowship and education as we work to bring issues of mental illness into the light in communities across SW Iowa. ​Iowa State University Extension and Outreach will offer the Iowa Master Conservationist Program for six weeks on Tuesday evenings, May 7th through June 11th. The program will take place at Willow Lake, Dinesen Prairie, Loess Hills State Forest, DeSoto National Wildlife Refuge, Prairie Rose State Park, and a presentation by the Henry Doorly Zoo at Nishna Bend. Hours for the program are 6 to 8:30 pm. Registration for the course is $100 and is due at time of registration. Deadline to register is May 4th. Call 755-3104 to register. 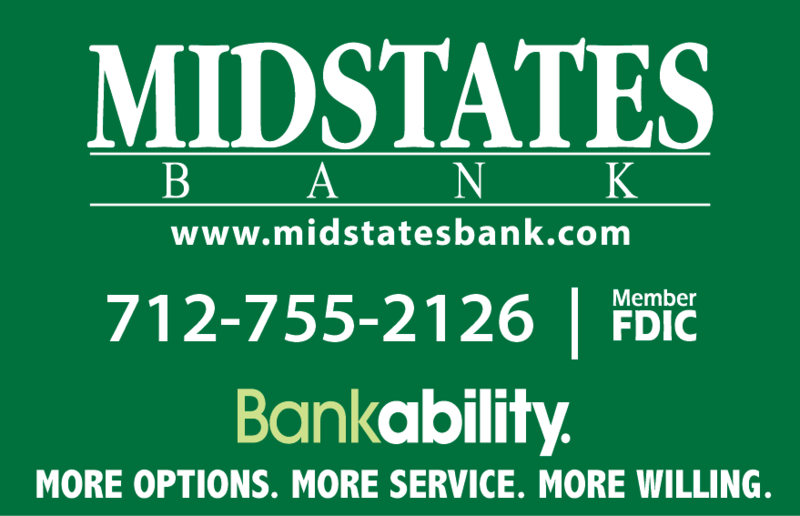 The Relay for Life Team of "Banking on a Cure" will be holding their annual Purse-uing a Cure Silent Auction at the Shelby County State Bank Main Branch, starting on Monday, May 6th. Purses will be on display May 6th through 3 pm, Friday May 10th with final Bids due by 3 pm Friday. All proceeds will benefit Relay for Life of Shelby County. Dad's Belgian Waffle Fundraiser will be held Monday, May 6th, from 4:30 to 7 pm at St. Michael's Parish Center in Harlan. This event is sponsored by Concerned, Inc. and is a fundraiser for all of their projects. The cost is $6 in advance or $7 at the door, kids 6-12 $4 in advance or $5 at the door. 5 years and younger can eat free. 3:00 pm - Crochet 101 - 3 part class ($10) pre-registration required. Myrtue Medical Center's Community Health will hold free and confidential Hepatitis C and HIV testing on Tuesday, May 7th from 2:30 to 5 pm at their office. Anyone is welcomed to be tested and no appointment is needed. The Learning for Life program is hosting a fun, interactive evening, Fishing For Fun, at Nishna Bend Recreational Area on Tuesday, May 14th from 5:30 to 7:30 pm. This event is for families with children 12 years of age and under or those with special needs. Prizes will be provided for children who attend. Supper will be provided at no cost to registered families. Contact Myrtue Medical Center’s Department of Public Health at 755-4422 for more information or to register. The Sixth Annual Color Run For The Cure - Located at the Harlan Fairgrounds (314 4th Street, Harlan). Cost is $25 ($30 for for late registrations) for participants and includes a t-shirt. No Refunds for any reason. The Shelby County Historical Society will host Log Cabin Day on Sunday, June 2nd. The event will feature live demonstrations, speakers and re-enactors, music, food vendors and much more. Call 755-2437 for more information. Myrtue Medical Center’s Office of Community Health will hold an Immunization Clinic for children Wednesday, June 5th, from 2 to 6 pm. Immunizations are free for children that qualify for the VFC program. If you have insurance that pays for immunizations including Hawk-I, please call Myrtue Medical Clinic at 755-4516 to schedule an appointment there.